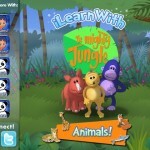 iLearn with the Mighty Jungle is a limited app with limited appeal. But if you have a toddler of just the right age, you’ll probably get some decent use out of it. I wouldn’t hesitate to recommend it, at least for a test drive, at its current price (free!). But its current price is an extension of a limited-time offer and the value proposition won’t be nearly as attractive once this app moves back to its regular price of $2.99.